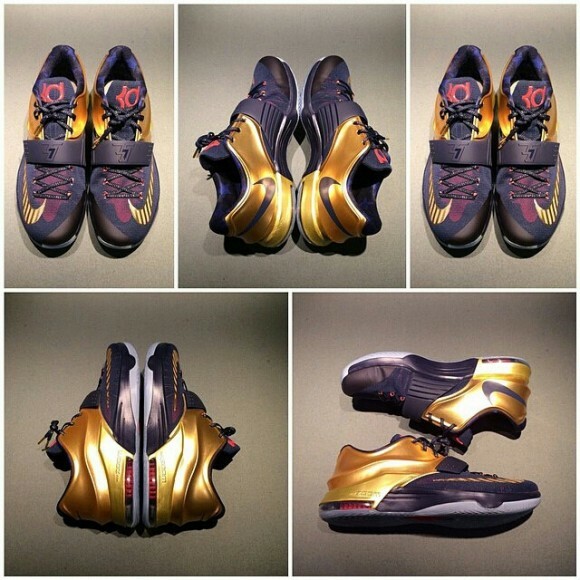 Although there is still no release information for these gold KD 7’s, we now have a better look at the full shoe. From these new images, it’s clear that the upper is a navy blue, not black as was originally suspected. Blue stars on the lining and red accents through the toebox, the KD Logo, and the Max Zoom bag identify these as a ‘USA’ or ‘Gold Medal’ edition of the shoe. I love the color blocking on this particular pair. The contrast of the mesh and Posite materials is accented well by having two different colors. The gold is shiny, but not so much that the shoes feel gaudy. As always, stick with WearTesters as more information becomes available about this pair, and let me know below what you think about these. I'm a Computer Engineering major at the University of Nebraska-Lincoln (Go Big Red!) with a passion for all things sneaker related! You can find me on IG and Twitter @rkade93, and on YouTube as Rkade Kicks. these are a must cop. if they had a solid outsole, they’d be perfect!! I have the 35k CW which is dope but these look so good man! Are these outsoles clear or just solid grey? I can’t tell.